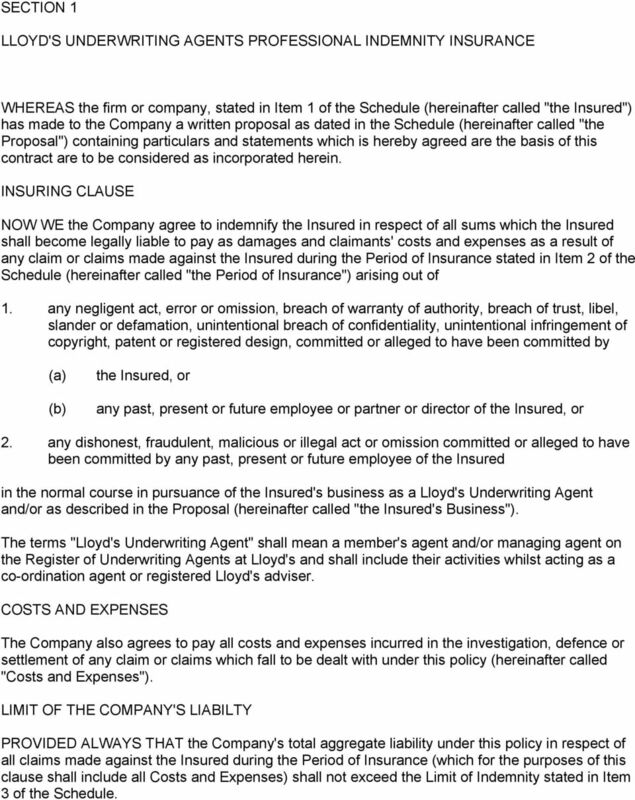 Download "Notice of claims or circumstances should be given to the Company via:"
2 SECTION 1 LLOYD'S UNDERWRITING AGENTS PROFESSIONAL INDEMNITY INSURANCE WHEREAS the firm or company, stated in Item 1 of the Schedule (hereinafter called "the Insured") has made to the Company a written proposal as dated in the Schedule (hereinafter called "the Proposal") containing particulars and statements which is hereby agreed are the basis of this contract are to be considered as incorporated herein. 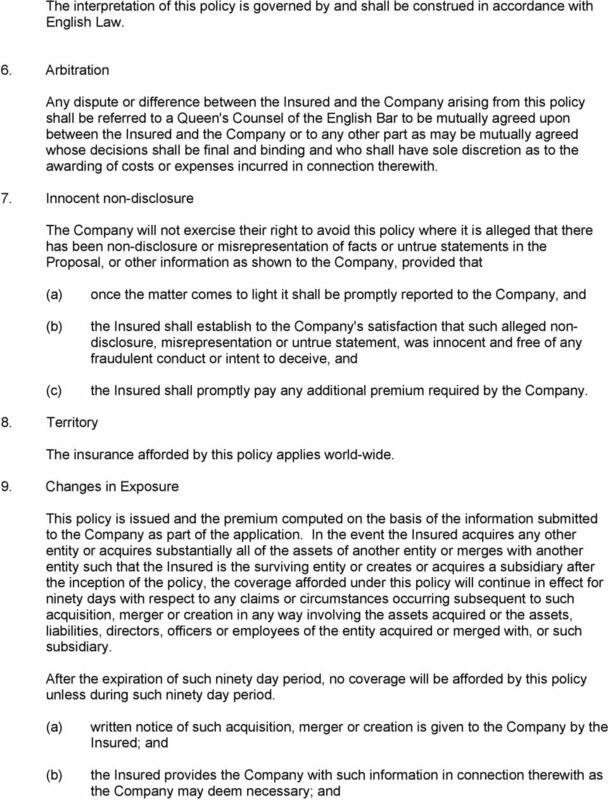 INSURING CLAUSE NOW WE the Company agree to indemnify the Insured in respect of all sums which the Insured shall become legally liable to pay as damages and claimants' costs and expenses as a result of any claim or claims made against the Insured during the Period of Insurance stated in Item 2 of the Schedule (hereinafter called "the Period of Insurance") arising out of 1. any negligent act, error or omission, breach of warranty of authority, breach of trust, libel, slander or defamation, unintentional breach of confidentiality, unintentional infringement of copyright, patent or registered design, committed or alleged to have been committed by the Insured, or any past, present or future employee or partner or director of the Insured, or 2. any dishonest, fraudulent, malicious or illegal act or omission committed or alleged to have been committed by any past, present or future employee of the Insured in the normal course in pursuance of the Insured's business as a Lloyd's Underwriting Agent and/or as described in the Proposal (hereinafter called "the Insured's Business"). 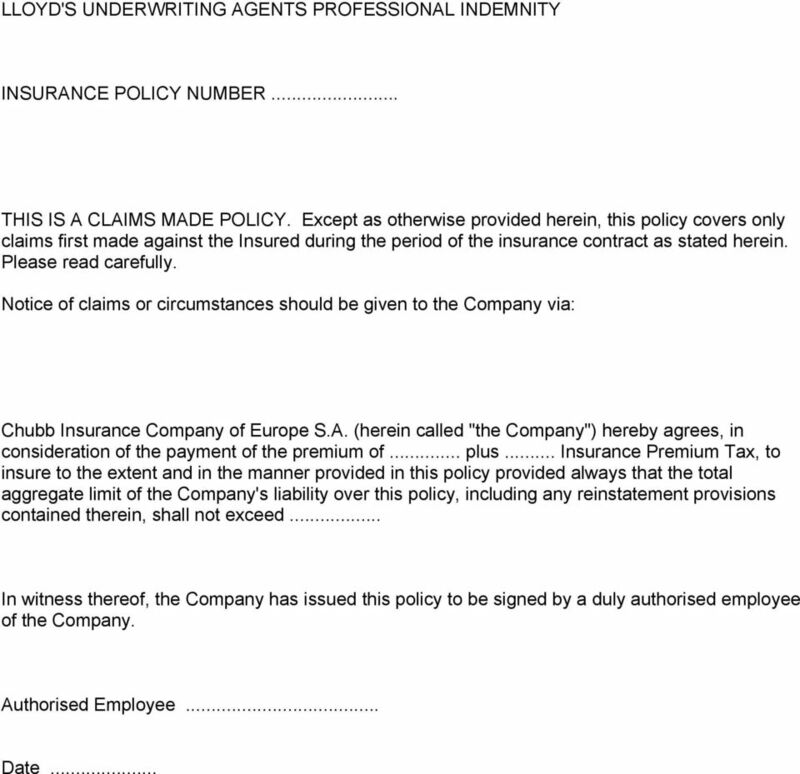 The terms "Lloyd's Underwriting Agent" shall mean a member's agent and/or managing agent on the Register of Underwriting Agents at Lloyd's and shall include their activities whilst acting as a co-ordination agent or registered Lloyd's adviser. COSTS AND EXPENSES The Company also agrees to pay all costs and expenses incurred in the investigation, defence or settlement of any claim or claims which fall to be dealt with under this policy (hereinafter called "Costs and Expenses"). 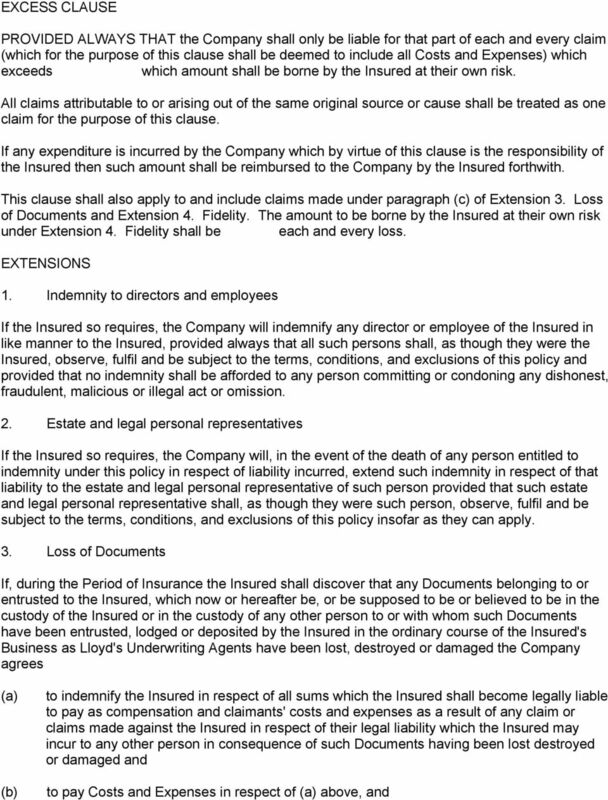 LIMIT OF THE COMPANY'S LIABILTY PROVIDED ALWAYS THAT the Company's total aggregate liability under this policy in respect of all claims made against the Insured during the Period of Insurance (which for the purposes of this clause shall include all Costs and Expenses) shall not exceed the Limit of Indemnity stated in Item 3 of the Schedule. 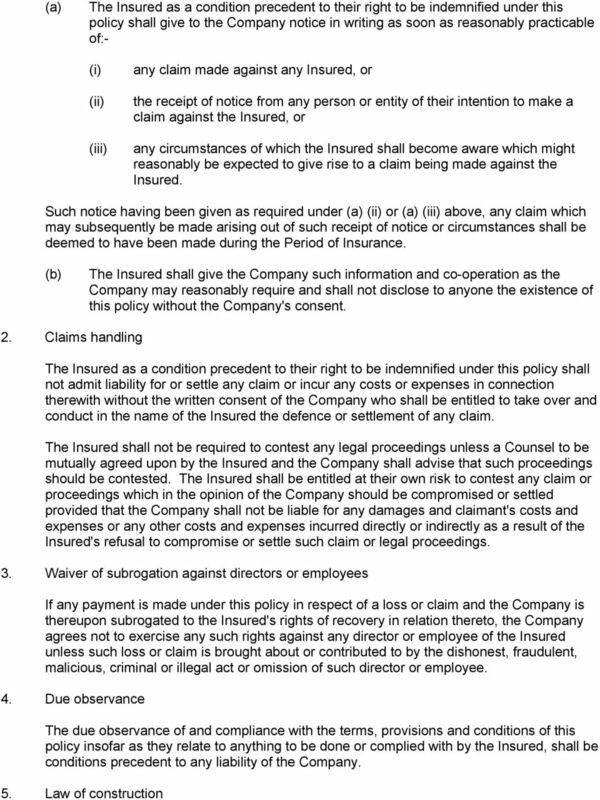 5 1. the liability of the Company in respect of further dishonest or fraudulent acts by an employee shall cease from the time that the Insured or any company or any other entity forming part of the Insured or any partner, director, trustee or officer of the Insured or such company or other entity not in collusion with such employee shall have knowledge or information that such employee has committed any dishonest or fraudulent act whatsoever whether such act shall have been committed before or after the date of employment by the Insured. 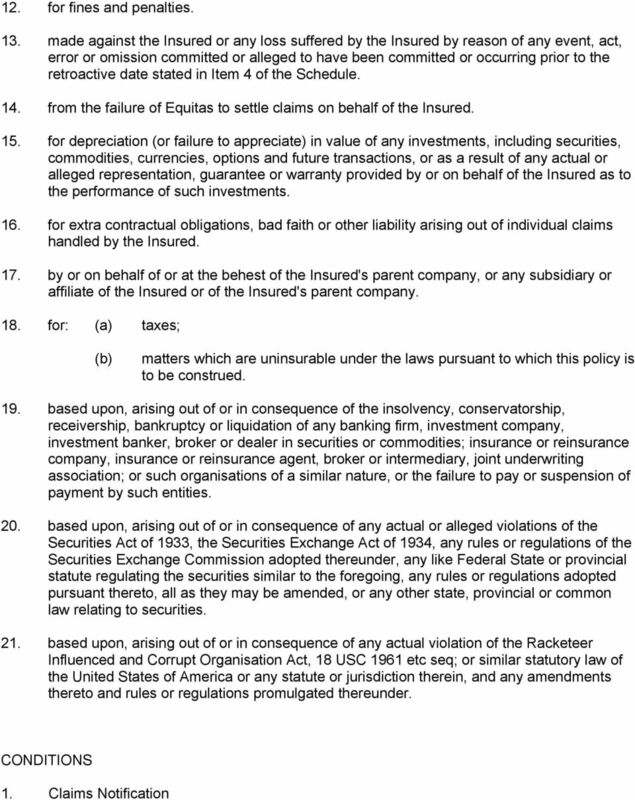 2. if following any loss or losses the Insured is unable to identify the specific employee or employees concerned the evidence submitted by or on behalf of the Insured shall prove beyond reasonable doubt that the loss or losses were sustained as a result of any dishonest or fraudulent act or acts committed by one or more employees. The term "improper financial gain" used in the foregoing does not include any employee benefits earned in the normal course of employment including salary, promotions, fees, bonuses and other similar emoluments. 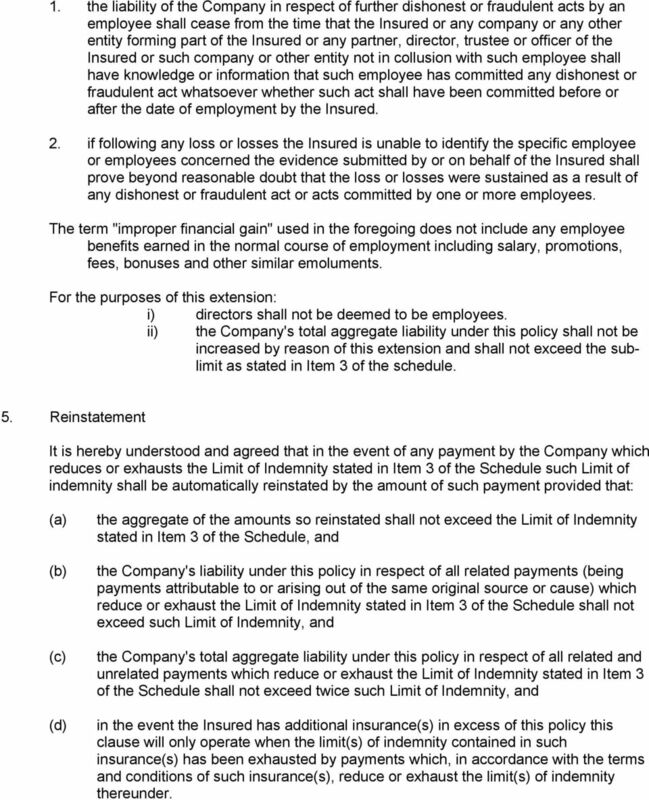 For the purposes of this extension: i) directors shall not be deemed to be employees. 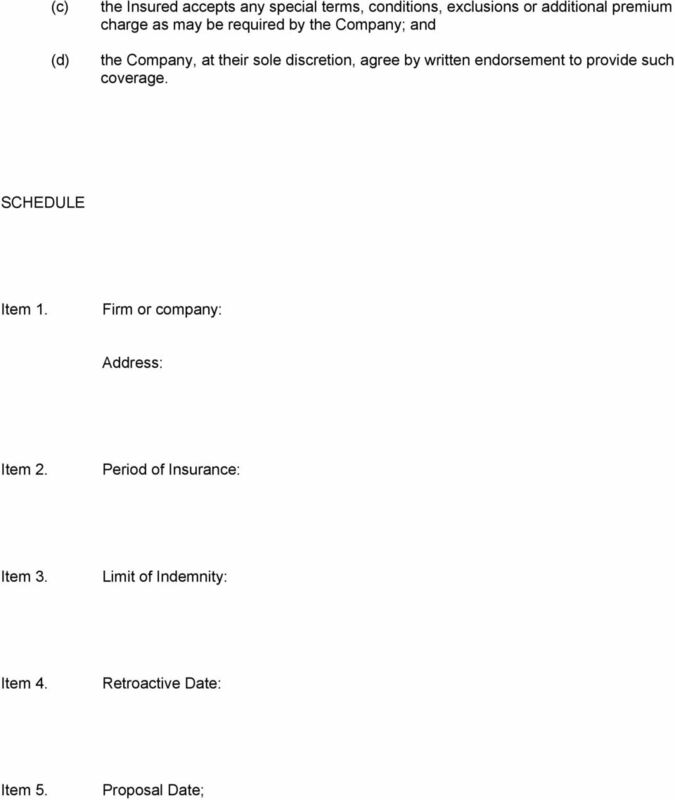 ii) the Company's total aggregate liability under this policy shall not be increased by reason of this extension and shall not exceed the sublimit as stated in Item 3 of the schedule. 5. Reinstatement It is hereby understood and agreed that in the event of any payment by the Company which reduces or exhausts the Limit of Indemnity stated in Item 3 of the Schedule such Limit of indemnity shall be automatically reinstated by the amount of such payment provided that: (c) (d) the aggregate of the amounts so reinstated shall not exceed the Limit of Indemnity stated in Item 3 of the Schedule, and the Company's liability under this policy in respect of all related payments (being payments attributable to or arising out of the same original source or cause) which reduce or exhaust the Limit of Indemnity stated in Item 3 of the Schedule shall not exceed such Limit of Indemnity, and the Company's total aggregate liability under this policy in respect of all related and unrelated payments which reduce or exhaust the Limit of Indemnity stated in Item 3 of the Schedule shall not exceed twice such Limit of Indemnity, and in the event the Insured has additional insurance(s) in excess of this policy this clause will only operate when the limit(s) of indemnity contained in such insurance(s) has been exhausted by payments which, in accordance with the terms and conditions of such insurance(s), reduce or exhaust the limit(s) of indemnity thereunder. 6 EXCLUSIONS The Company shall not be liable to indemnify the Insured in respect of any claim 1. arising directly or indirectly from bodily injury, sickness, disease or death sustained by any person arising out of and in the course of his/her employment by the Insured under any contract or service or apprenticeship, or for any breach of any obligation owed by the Insured as an employer to any employee. 2. arising directly or indirectly from the ownership, possession or use by or on behalf of the Insured of any land, buildings, aircraft, watercraft, vessel or mechanically propelled vehicle. 3. arising directly or indirectly from any dishonest, fraudulent, malicious, criminal or illegal act or omission of the Insured. 4. arising directly or indirectly from any liability assumed by the Insured under any express warranty or guarantee unless such liability would have attached to the Insured notwithstanding such express warranty or guarantee. 5. arising out of or relating to goods or products, sold, supplied, repaired, altered, manufactured, installed or maintained by the Insured or any related company or by subcontractors of the Insured, other than brochures, advertising material and the like issued by or on behalf of the Insured in the normal course and in pursuance of the Insured's Business. 6. for bodily injury, sickness, disease, or death sustained by any person or any loss, damage or destruction of property unless such claim emanates from negligent advice, design, specification, formula or a breach of duty owed in a professional capacity by the Insured. 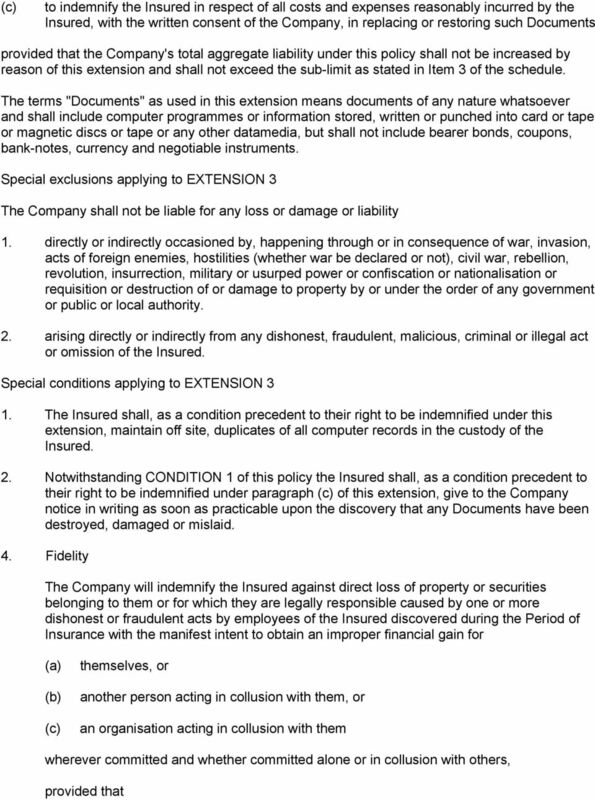 7. arising out of or relating directly or indirectly to the insolvency or bankruptcy of the Insured. 8. based upon, attributable to, or in any way involving directly or indirectly from or in consequence of or in any way involving seepage, pollution or contamination of any kind. 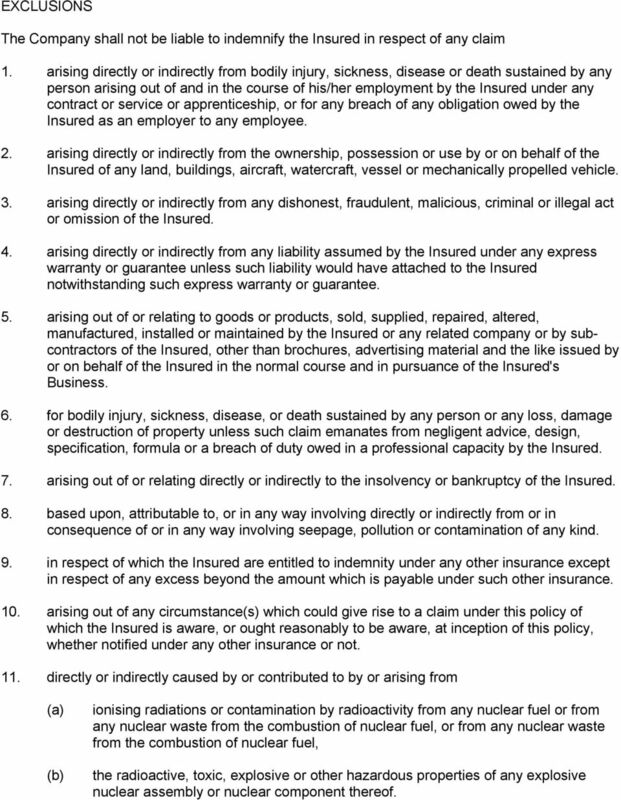 9. in respect of which the Insured are entitled to indemnity under any other insurance except in respect of any excess beyond the amount which is payable under such other insurance. 10. arising out of any circumstance(s) which could give rise to a claim under this policy of which the Insured is aware, or ought reasonably to be aware, at inception of this policy, whether notified under any other insurance or not. 11. directly or indirectly caused by or contributed to by or arising from ionising radiations or contamination by radioactivity from any nuclear fuel or from any nuclear waste from the combustion of nuclear fuel, or from any nuclear waste from the combustion of nuclear fuel, the radioactive, toxic, explosive or other hazardous properties of any explosive nuclear assembly or nuclear component thereof. Underwriting Agencies Professional Indemnity Insurance Policy Underwriting Agencies Professional Indemnity Insurance Policy CONTENTS SECTION 1 INSURING CLAUSES 1 A. Insuring Clause Clarifications 1 B.